It was a tough day yesterday. 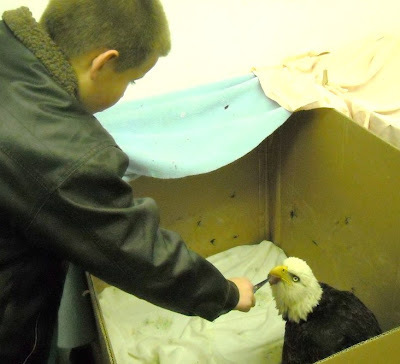 The adult trapped Bald Eagle had a serious crash. He developed pneumonia. By noon I thought we would lose him. Our veterinarians came through with an injectable form of a different antibiotic. Within a few hours the eagle looked better. 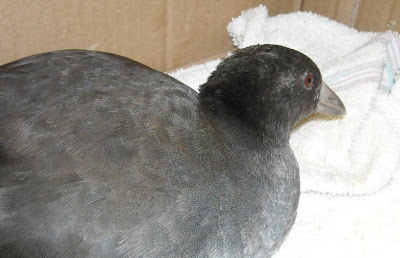 Pneumonia is a very difficult illness in birds due to their tiny but very efficient lungs. Lungs are one area where birds are very different than mammals. Keep us in your thoughts that he can pull out of this. We have been told that they found a name and address on the trap and therefore it was a legal set. We get trapped eagles in every year. It is not an easy thing on any level. I am not anti-sportsmen, but I do not think it is fair that we foot the bill and care for these magnificent eagles that were simply fishing in the wrong place. Trapping is less a sport than a business. My private frustration is there seems to be no sense of responsibility in these cases. It seems to be more a sense of someones "right" to do it. In all the years I have done this, I have only had one trapper horrified at having caught a "non-target" species. He cared, I wish they all did. Forgive my grumbling but I think it is valid in this case. 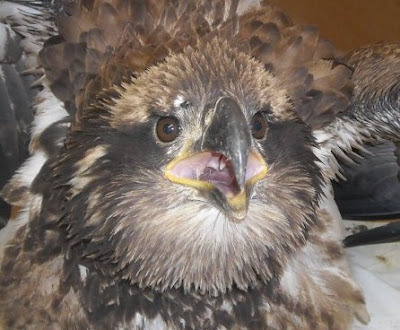 On the other side of things the young Bald Eagle with the wing fracture is doing well. Her sassy personality is good for us especially with the sad case next to her. Her DNA needs to be out there for the future. I picked up a young Turkey Vulture with a wing fracture and an American Coot that has been hit by a car at the same stop yesterday. The Turkey Vulture was transported by DNR Biologist Chris Cold from Ladysmith area. Chris is an amazing person, great biologist, educator and all around great guy. I wish we could clone him. The Turkey Vulture was found wing an injured wing at least ten days after the other vultures migrated from the area. The little guy was scared! I put him in with my adult foster parent Turkey Vulture when we got back to REGI. The little guy could not believe his eyes! The adult actually fed him within minutes of meeting him for the first time. He reverted to babyhood and gladly accepted being treated like a fledgling. 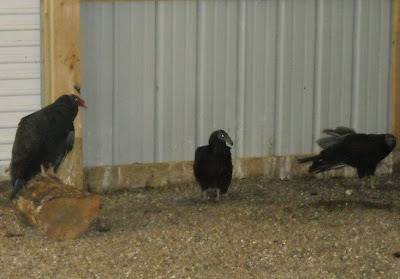 The other young Turkey Vulture admitted last week is also doing well in the company of our foster parents. What a difference those adults make for the frightened babes. We could learn so much about parenting from birds. 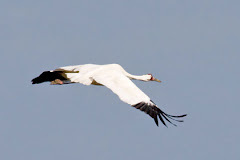 They do not have to be their biologic young for them to care for and protect them. 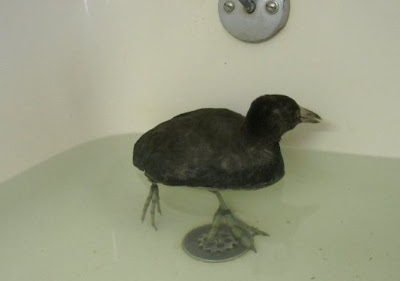 We admitted a young American Coot that had been hit by a car. This guy is so young we have to wonder what his folks were thinking when they had such a late brood! The staff loves him! Within an hour he was happily eating and swimming. He has an injured leg, but everything else seems to be working. Today will busy. We are releasing a Great-horned Owl in the Wausau area at 6:00 pm if anyone is interested in seeing the release give us a call for the location. This is a young bird that was raised at REGI by foster parents. She is SOOO Beautiful. Photos will be on the blog tomorrow! Have a good day and keep us in your thoughts.